Chulapanthaka (Skt. Cūḍapanthaka; Tib. ལམ་ཕྲན་བསྟན་ Lamtren Ten; Wyl. lam phran bstan) or Kshudrapanthaka (Skt. Kṣudrapanthaka) — one of the Sixteen Arhats and Panthaka's brother. As a disciple he was exceedingly dull and stupid; he could not apply his mind or commit to memory even one stanza of doctrine. The Buddha gave him the words "Get rid of the dust, get rid of the impurities" and told him to sweep the floor as his practice. Eventually he started to think about the meaning of the words, and thereby attained realization. The Buddha appointed him to teach the nuns, some of whom were deeply insulted, but he soon led them to great realization through his teaching and miraculous displays. 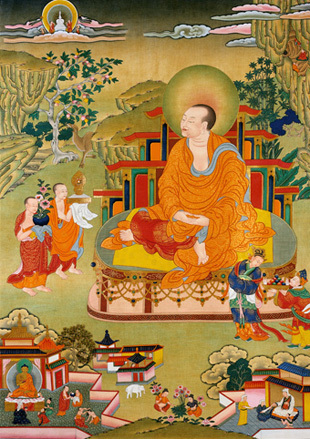 Chulapanthaka lives on Vulture's Peak with 1,000 arhats. His hands rest in the meditation mudra, signifying detachment from material values and unshakeable devotion. Invoking him frees one from desire, hatred and ignorance, the three poisons that predispose beings to suffer. This page was last edited on 5 August 2017, at 13:11.